Originally (and more aptly) entitled “Character Types from Populist Genres in Joseph Conrad’s Urban Fiction,” this volume examines the urban fictions of Conrad’s middle period, from The Secret Agent to Under Western Eyes and Chance, in the context of emergent popular genres such as detective stories, terrorist thrillers, and novels of espionage or financial scandal. The character types that define these genres – detectives, informers, anarchists, spies, terrorists, and swindlers – appear in Conrad’s works as well, with differences that Glazzard explores in detail. As he shows, Conrad was writing at a time when such liminally legal activities were being professionalized and institutionalized, and the popularity of these types offered him a profitable field for exploring the perspectival ironies of mistaken or disguised identities, of characters who are not what they seem. Glazzard has doubtless read far more of these once-popular works than even Conrad himself, whose literary “purism” (Glazzard’s term) made him shy of advertising his interest in popular (i.e., profitable) forms of literary entertainment. He corresponded with writers like Arnold Bennett and H. G. Wells, whose tastes were arguably more “popular” than his own, and The Secret Agent was dedicated to Wells. Grant Allen, Hilaire Belloc, G. K. Chesterton, Arthur Conan Doyle, and Rudyard Kipling are all mentioned in Conrad’s correspondence, but the indexes to the Collected Letters include no mention of other popular and prolific authors whom Glazzard cites frequently, such as Guy Boothby, R. Austin Freeman, William Le Queux, Edith Nesbit, Barry Pain, or E. Phillips Oppenheim. The best Glazzard can manage to claim, on the basis of remarks by Richard Curle and Edward Garnett, is that Conrad “read or was aware of” a number of popular authors (20), but the list that follows does not include the names of Freeman, Le Queux, Nesbit, Pain, or Oppenheim. Glazzard explains his choice to focus on character types rather than genres in part because Conrad’s response to genres like adventure fiction or imperial romance has already been studied, and also on the grounds that genres are unstable and constantly changing. Unfortunately, this same instability also applies to character types, and Glazzard has considerable difficulty distinguishing “specialist” detectives like the Assistant Commissioner from regular detectives like Inspector Heat, or anarchists from terrorists. Like genres, these character types are not mutually exclusive: Privy-Councillor Mikulin is both a detective and a spymaster; Verloc is a “sham” anarchist as well as a police informer. And who is the real “terrorist” in The Secret Agent? As Glazzard observes, “Conrad’s political fictions feature a range of anarchist, revolutionary or terrorist character types, each of which is recognizable from the period’s popular fiction” (112). But these types necessarily overlap in Conrad’s works in ways that are not typical of popular fiction, so that Glazzard in subsequent paragraphs speaks of hyphenated “anarchist-terrorists” (113), a “revolutionary-terrorist” (115), and “anarchist-idealists” (117), recalling the efforts of Polonius to define the various theatrical genres. As the melancholy Jacques put it, “one man in his time plays many parts.” The Professor might seem a pure and perfect type of something – a cynical Nihilist devoted to “the destruction of what is”? – yet Glazzard identifies him in hybrid terms, as “a generically complex, or perhaps indeterminate, figure, combining utopian technologist, incompetent terrorist and lonely bachelor” (140). Another problem results from Glazzard’s reluctance to allow for any essential difference between literature and popular fiction: “we might consider ‘literary fiction’ to be itself a genre, albeit one that often pretends to be outside or above such categorization” (5). This is certainly the attitude of booksellers whose shelves distinguish (popular) “Fiction” from “Literature,” and who for obvious reasons exile the latter to the most remote corner of the store. The future may well prove Glazzard right; but he ignores the characteristic ideological conservatism of popular genres in which, thanks to clever detectives and courageous heroes, the reader is always returned in the end to the status quo ante reaffirmed as a safe space in which heroes never die, crimes are always solved, alien invaders always defeated, and terrorists invariably caught or killed. As a consequence, when comparing Conrad’s work with that of popular authors, Glazzard is repeatedly obliged to conclude that Conrad’s texts are relatively “complex and ambivalent” (11) or “complex and ambiguous” (141). There is no acknowledgement of a link between this complex ambiguity and Conrad’s ambition to produce work that “aspires, however humbly, to the condition of high art.” Instead we are told that “Conrad was doing something innovative with established genres” (83), that “Conrad’s novels are ... generically inclusive, unstable and challenging” (180), or that “[h]is works challenged the boundaries of the commercial and the literary so fundamentally that where we position him depends on what aspects of those works we wish to emphasize” (183). Still, this volume is a worthy complement to the pioneering studies of Conrad’s relation to popularity by scholars like Andrea White, Linda Dryden, and Stephen Donovan. 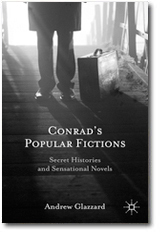 Glazzard reminds us of the transient fame of many volumes that can no longer be found even in the “Fiction” section of the bookstore, and of the context within which Conrad experimented with popular character types in an ironic and artistic manner.